The laws of the medieval church (canon law) began to be published in more or less methodically organised collections (decretals) only in the mid-12th century, but without providing a means of organising the decrees of subsequent popes. In 1298, Boniface VIII published the 'Sixth Book of Decretals' ('Sext') which updated and streamlined all previous decretals. Commentaries, to aid study and application, were written in the decretals manuscripts, either around the margins of the law text (gloss) in a specialized page layout or published on their own. This manuscript of the 'Sext' with its most important commentaries is believed to have belonged to the Benedictine abbey at Reading, where study of law was an important pursuit. 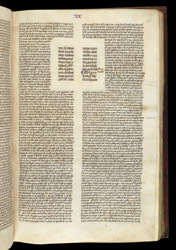 Commentaries often took up most of the page. Here Jean le Moine's commentary, known as the 'Glossa Aurea' ('Golden Gloss'), is written on two column-like sections around a small bit of text from the 'Sext', which occupies a tiny space in the midst of the commentary. On the left edge of the commentary, the small inscription in lighter-coloured ink is a later gloss on the section that is marked.